Please contribute to this community response to the suffering of war. There will be yoga practice, tai chi, peace offerings, prayer flags and more. This is apart of the Consuming War exhibit. Geraldine Gorman, RN, PhD, speaks about Emergency, the international relief organization providing treatment to civilian war victims. Donations will be accepted. HELP US BUILD THE PEACE! Plan NOW to join us on Friday, September 21 in Daley Center Plaza as we celebrate Peace Day in Chicago and the International Day of Peace. Peace Day includes the Call to Peace and the World Peace Flag ceremony. As each nation's flag is respectfully presented on stage, we join in saying together, "May peace be in [each country, named one-by-one]". VOLUNTEERS ARE NEEDED! If you would like to carry the flag of one world nation, call The Peace School today at 773.248.7959. The purpose of the Global Mala Project is to unite the global yoga community from every continent in the world, forming a "mala around the earth" through collective practices based upon the sacred cycle of 108. On September 21st - 23rd, Fall Equinox and the United Nations International Day of Peace, studios, teachers and organizations across the globe will create fundraising celebrations, raising funds and awareness for some of the most essential issues of our times. On behalf of Prostrations for Peace, we wish to thank every one of you for your individual contribution to such an amazing ceremony. Each person involved helped to cultivate an energy that literally buzzed on the pier, and continued some days later. Events like these are so important for us in this time of suffering, and though we may not feel like we can end the war, it is just as important—perhaps even more important than ever—to be involved in promoting peace, in living peaceably. Although sometimes it feels like we are helpless alone, it is when we join together as a grassroots community that we realize what we can do something. Prostrations for Peace made that a reality for many of us. The ceremony was covered on Fox News, CLTV, Chicago Public Radio, WLUW, and ABC News. Other people used footage and interviews for documentary and photo essays. We ended up raising over $700 for EmergencyUSA. 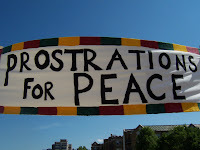 Our website is designed as a forum for peacemaking in Chicago. Please feel free to comment, reflect, and respond to what happened that Sunday. 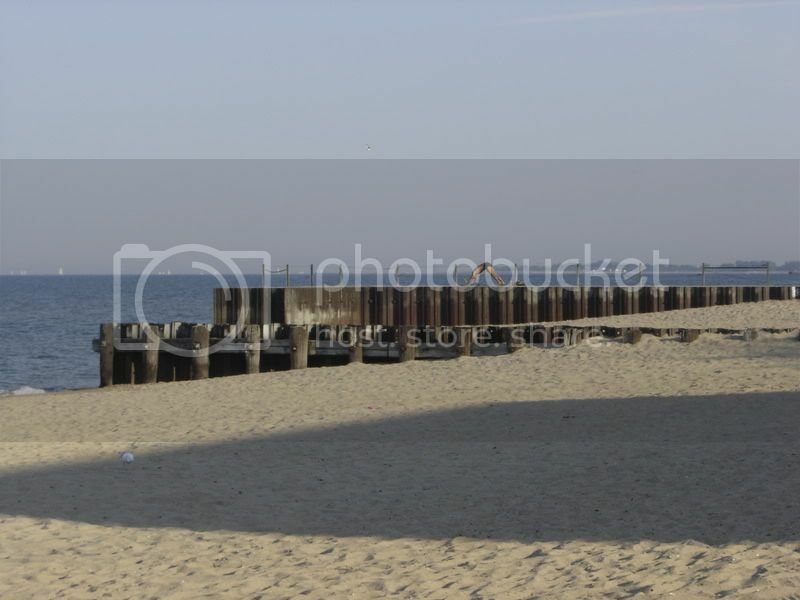 Post links to your photographs, to your peace organizations, to your websites. Post ideas, blogs, prayers, hopes for the future. We intend to keep updating Prostrations for Peace with upcoming peace events in Chicago, so keep checking and contributing as you wish. We hope to work toward organizing and participating in other peace events in the city. Again, thank you for making such an important day happen. 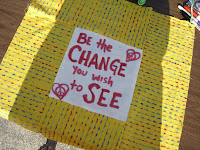 Keep being the change you wish to see in the world. Please, post your reactions, upcoming events, reflections, links, and photos to our blog by clicking on "ADD COMMENT" below. Organizer Don Sorsa's beautiful photography. Join us now at the Heartland Cafe (7000 N. Glenwood) for an after-ceremony celebration honoring Emergency USA. We're on the small pier right now, performing sun salutations, prostrations, and bows. Meditating. Offering prayers. Making peace flags. Building an altar of flowers notes, incense, candles. And striking a gong for each day of the War in Iraq -- 1,579 days total. We are here till sunset. Please join us afterward for a celebration at the Heartland Cafe (Glenwood and Lunt) for Emergency USA, a humanitarian, neutral, non-profit organization that provides high-quality treatment, surgery, and rehabilitation to civilians in war and post-war areas around the world, including Iraq and Afghanistan. Emergency also trains medical and non-medical personnel in these areas. We encourage you to carpool if you must drive, as there may be a limited number of parking spaces on Sheridan Road and along side roads. See our map at GoogleMaps to search for directions. If you are coming from the suburbs, you may use the Metra or Amtrak rail systems, hop on the Red line North toward Howard, and exit at the Loyola stop. 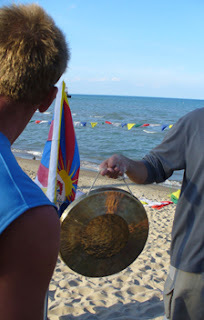 You'll find Prostrations for Peace across Sheridan on the beach. If you live in Chicago, we encourage you to use public transportation by going to the CTA's Trip Planner. 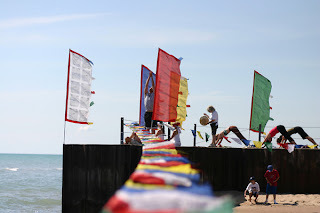 Prostrations For Peace is located off North Shore Avenue (1055 W North Shore Ave, Chicago IL 60626) on the small pier. 7000 N Glenwood Ave, just a few blocks from Prostrations for Peace.